With NCAA football just around the corner, and the NFL preseason already underway, it’s time to think about getting set up with your online sportsbook account. Whether you are new to betting sports, or are looking to bet smarter by adding additional books so that you can shop lines, I can recommend three online sportsbooks for the upcoming football season. Use promo code FIRST on your first-ever deposit to score a 25% bonus, worth up to $1,000.00 in sports free plays. Get a 25% bonus on your subsequent deposits using promo code LIFEBONUS. Both promotions have only a 6x rollover. 50% match on your first deposit. Win up to $10 with no risk on every Monday Night Football Game. Free contests run all week. And get $5 free at the casino. 50% match on your first deposit. Online sports betting has never been easier than with Bovada. Bet anywhere, anytime with our Mobile Betting, Live Sports Betting, and In-Play Betting odds and action. As always, if you have any questions, send me an email and I will be happy to help! Since Black Friday in April 2011, online poker players in the United States have been struggling with not only where to play, but also with how to make deposits and withdrawals from their accounts in a way that minimizes the fees to conduct these transactions. Granted, medium-to-high-stakes players probably worry less about these fees, but for recreational, low-stakes players, fees make a difference. Doyles Room Poker – 100% bonus on initial deposits between $25 and $1000! Bodog Poker – 110% bonus on initial deposits between $20 and $1000! Cake Poker – 110% bonus on initial deposits between $25 and $545! Poker4Ever – 100% bonus on initial deposits between $10 and $500! I’ve just spent several hours running down as many details as I can about their deposit and withdrawal options, and their associated fees. It is frustrating to say the least. Often times, the information that they have on their sites is out of date, unclear, or is contradictory to information that they have published elsewhere. So, as far as I can tell, only DoylesRoom offers online poker with no fees for certain deposit and withdrawal methods. Specifically, DoylesRoom offers no-fee Visa deposits ($20 minimum); in addition, they will credit to your account any fees incurred when depositing via Western Union or MoneyGram (both $200 minimum). On the withdrawal side, they offer 1 free check-by-mail per month ($20 minimum), as well as debit cards ($5 monthly fee + per-load and per-use fees). Remember the good old days of the free (or nearly free) e-wallets like FirePay, NetTeller, eWalletXpress, EcoCard, Click2Pay, QuickTender/UseMyWallet? Me too. 🙁 The current e-wallets that are accepted by various online poker sites all have 5% or more fees by the time you perform one deposit and one withdraw. The online poker site itself does not charge any fees to use these e-wallets, but the fees to load the e-wallet and then make a withdraw are substantial. BoDog Poker supports MyPaylinQ, which loads via credit cards at 7% fee, or for free via Western Union (WU). But the only payout option is WU with a $20 MyPaylinQ fee + WU fees. Cake Poker supports MoneyLineWallet (MLW), which charges $4 per load from your linked checking account. However, Cake Poker cannot payout back to your MLW account. Even if they could, there are MLW payouts fees — via a check for <$1000 (the fee is $10) and via a Bank Wire for larger amounts (with a $55 fee (plus your bank may charge an incoming international wire fee)). Poker4Ever supports PICCLUB, which has the same load and payout fees as MyPaylinQ. Real money online poker players that reside in the United States have fewer options for their online poker play since Black Friday of April 2011. As I am sure you are aware, many online poker rooms have left the United States market in light of the FBI’s actions on that day. 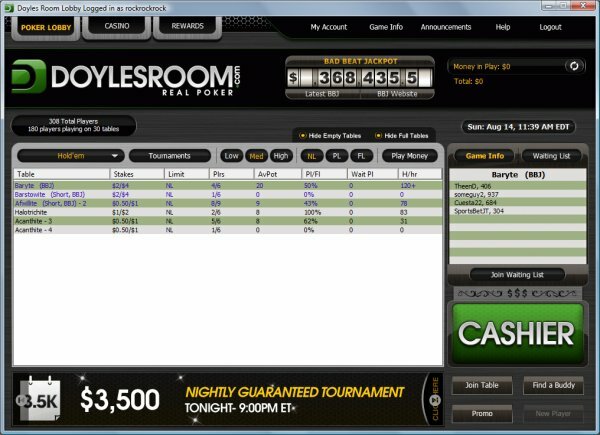 DoylesRoom.ag has decided to keeps its online poker room open to US players. They are even allowing new accounts to residents of the United States (except WA and MD residents). They have recently moved to the Yatahay Online Poker Network, joining a half dozen or so other online poker rooms on the network. In addition, they are offering a LIMITED TIME initial deposit bonus of 100% when you deposit between $50 and $1000. Doyle’s Room deals Hold’em, Omaha, Omaha Hi/Lo, 7 Card Stud, and 7 Card Stud Hi/Lo tournaments (both normal and turbo) and cash games in fixed limit (FL), pot limit (PL) and no limit (NL) formats. You can easily find your favorite game using the filters provided in the poker lobby. The easiest way to make a deposit at Doyle’s Room is with your Visa card. Otherwise, you can deposit via a Bank Wire or a Person-to-Person transfer; however, these deposit options are obviously less convenient than depositing via your Visa credit card. There is a $50 minimum deposit — this is perfectly reasonable, in my opinion. Your best withdraw option is probably a bank draft / check. Checks can be requested for between $25 and $2500 once per week and have no fee! You can also choose debit cards as your withdrawal method, but there is a $5 monthly fee, plus a load fee of $2 each time that you load the card. Debit cards usually also have a per-transaction fee when you use the debit card to make a purchase. Your online poker options are limited if you live in the United States. Doyle’s Room is a solid online poker room that you should consider for your online poker play. If you think that you’re better than most players at skill games like checkers, chess, backgammon, gin, cribbage, dominoes, canasta, and solitaire games, I have a great site for you. GameColony hosts both free and cash skill game tournaments, and players from 35 US States are eligible to play. (Players are barred from: Arizona, Arkansas, Delaware, Florida, Iowa, Illinois, Kentucky, Louisiana, Maryland, Missouri, South Carolina, Nevada, Ohio, Washington and Vermont.). Sign up for an account at GameColony — it took me about a minute, since all you need to provide is your choice of a screen name and password, and your birth year. Use the free-play option to check out the games that they have to offer. You’ll want to get familiar with the games and the rules before you play for cash. Fund your account using PayPal or a credit card for as little as $5.95. You get $Tickets in exchange for your deposit. Play the games either head-to-head or in multi-person tourneys for $Tickets. Approximately 85% of the $Ticket entry fees are returned to the winners. Any time that you have more than 2 $Tickets, you can convert them back to cash and make a withdrawal back to your PayPal or credit card. Withdrawals in excess of your original deposit are sent to you as a check. Good luck at the games!